urad dal ladoo recipe with step by step photos – tasty ladoos made with urad dal (black gram), sugar and ghee. 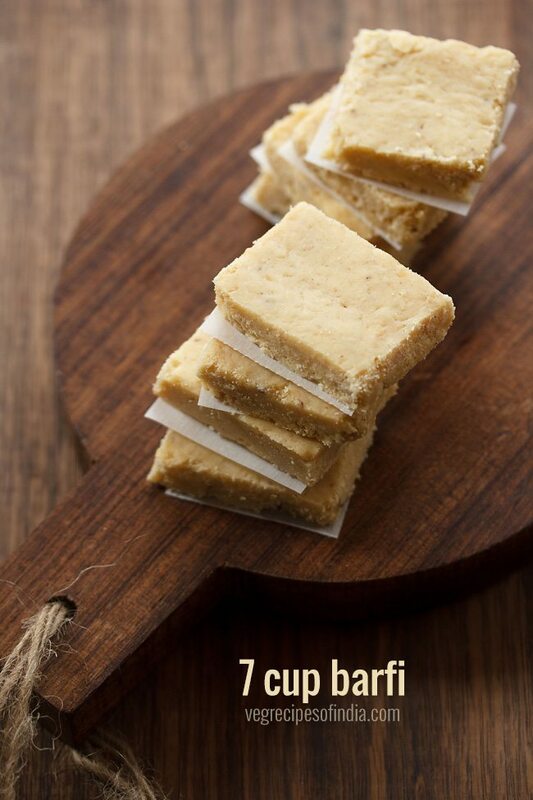 since festive season is around the corner, i plan to add some sweets recipes. though the addition of sweet recipes will be less as compared to the savory recipes i will be adding. 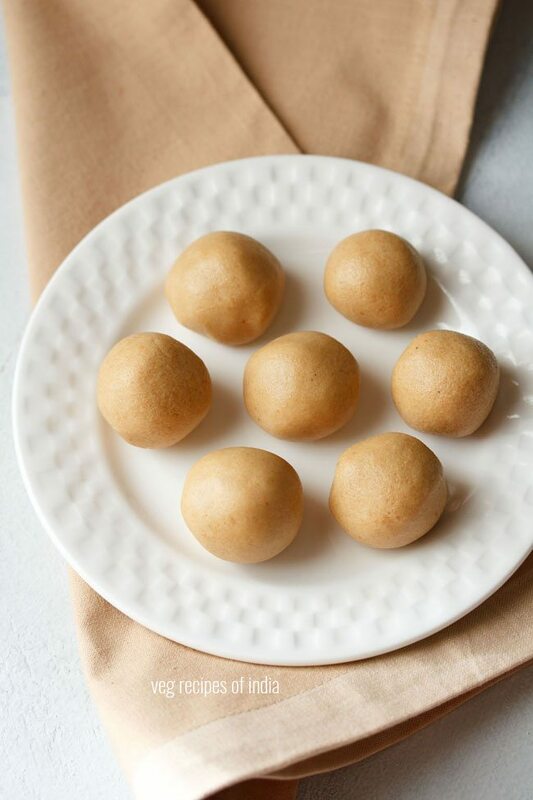 these urad dal ladoo are easy to make and are protein rich ladoos. though not very quick as there is a waiting time to cool the urad dal after its roasted and then wait for the ladoo mixture to cool down before shaping it. i have not added any fry fruits in the ladoos, but you can add them. 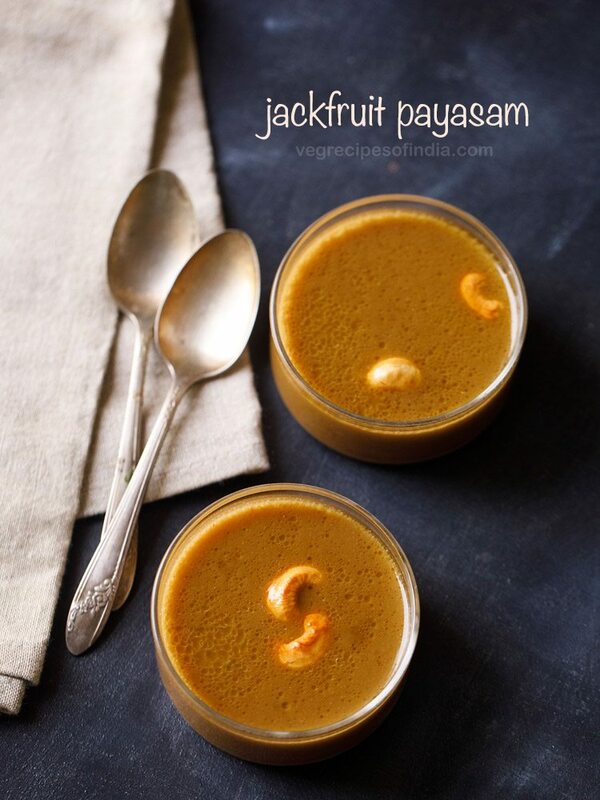 the crux of this recipe is to really roast the urad dal very well. or else there can be stomach aches. i have explained the roasting part in detail in the step by step pics part. urad dal laddu are tasty and have the nutty aroma of roasted urad dal. taste wise they are very different from atta ladoo or besan ladoo. like most ladoos made with ghee, these stay good in the fridge for a couple of weeks. you can also keep at room temperature for a few days. heat a thick bottomed pan or kadai on a low flame. then add 1 cup urad dal in it. if you want you can rinse the urad dal first. spread the lentils on a plate or tray or on a cloth. dry the lentils naturally or in sunlight. once the lentils have dried, then add them in the kadai. if you want you can add directly too. keep the flame on low or sim and begin to roast the dal. continue to stir often while roasting. keep on roasting and stirring for even browning and cooking. 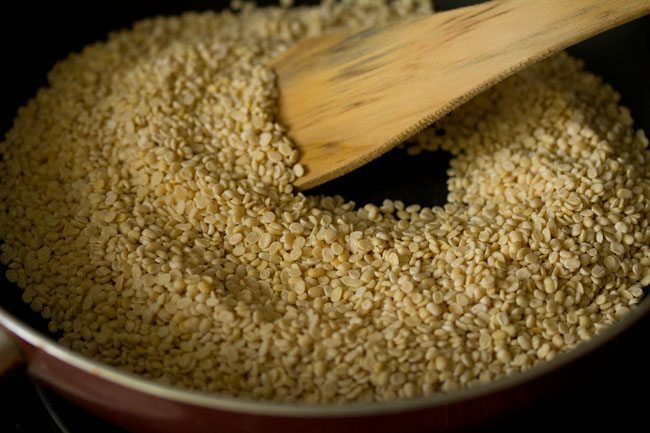 roasting urad dal well is very important or else there can be stomach aches. the dal needs to be golden and become aromatic. 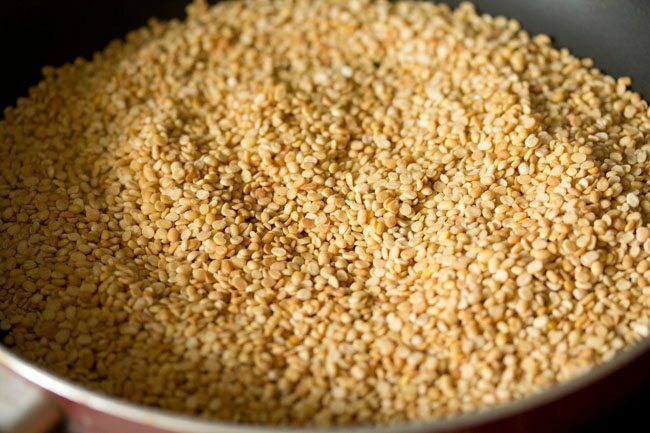 your kitchen will smell with the aroma of roasted urad dal. keep on stirring without a break once the dal begins to get light golden. when the urad dal become golden, then cool them in the pan itself or you can remove the dal in a plate and let it cool. 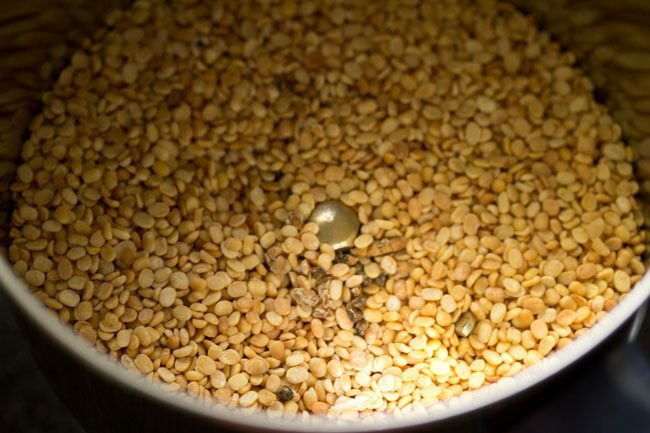 once the urad dal have become warm or cooled down, add them in a grinder jar. also add cardamom seeds removed from 3 to 4 green cardamom pods. now take the urad dal flour in a fine seive. 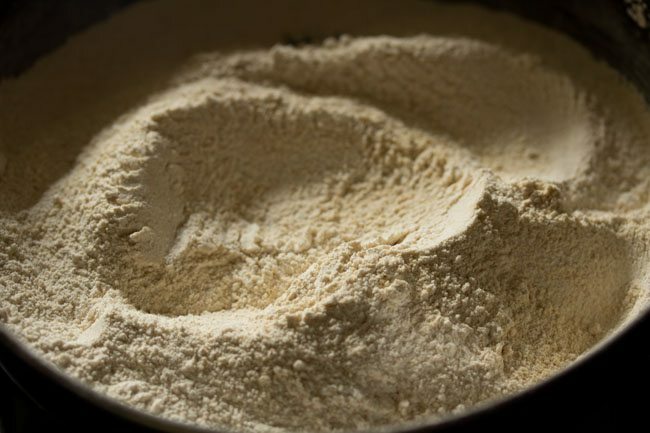 keep the sifted urad dal flour aside. 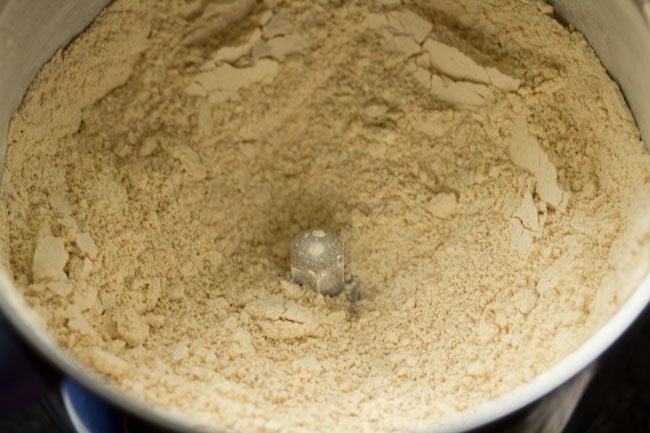 in the same grinder, add 1/3 cup sugar. now add the powdered sugar to the urad dal flour. if you want you can even sift the sugar and then add. now melt 1/3 cup ghee in a pan. you just need to melt the ghee and not heat it. add the melted ghee to urad dal + sugar mixture. 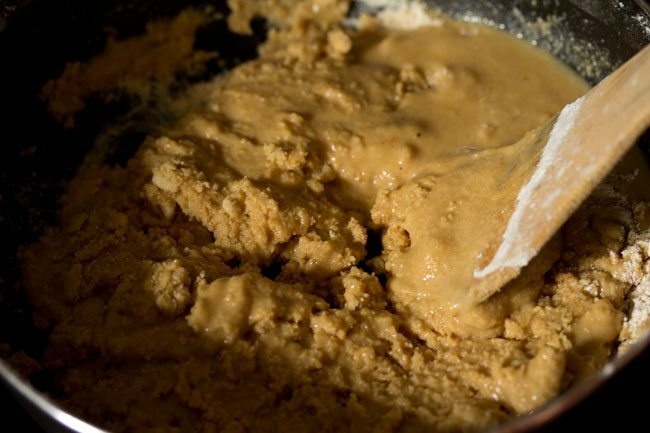 the ladoo mixture will have a molten consistency and will be a bit fluid. now let this mixture cool down at room temperature and let the ghee solidify. 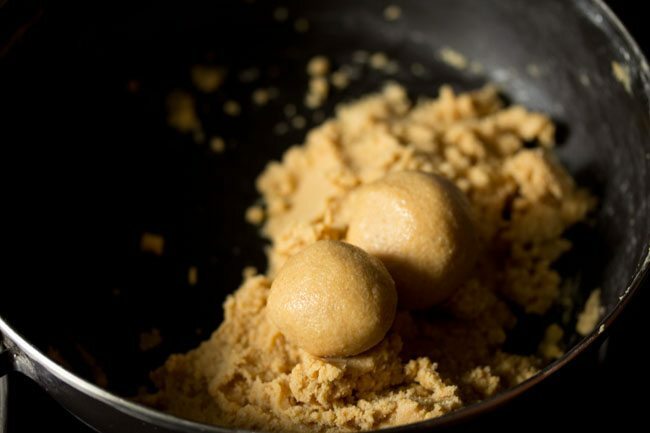 once the mixture becomes dense, then you can easily shape the mixture into ladoos. 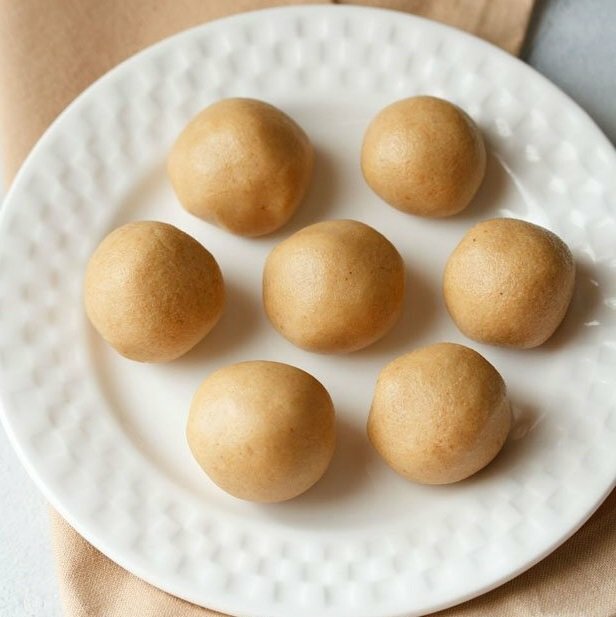 make small to medium sized urad dal ladoos. from the warmth of your hands, the ladoos will soften while you shape them. 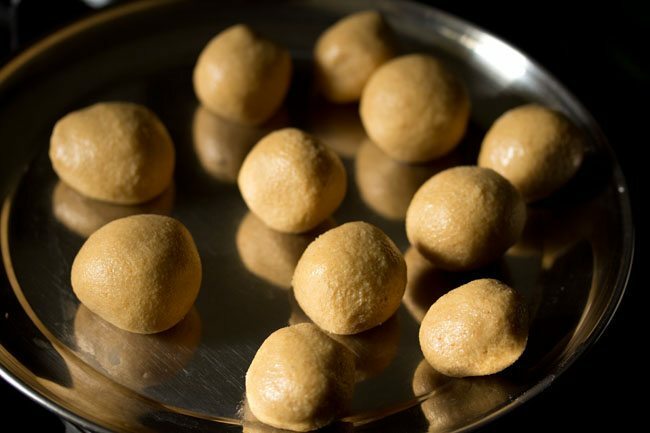 you can even offer these urad dal ladoo to the deities as naivedyam or serve to your family. 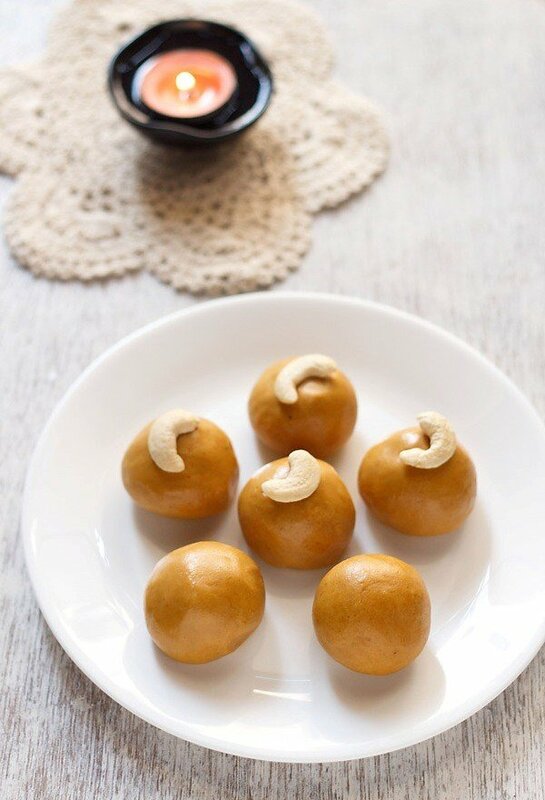 store the remaining urad dal laddu in an air tight box or jar and refrigerate. 1. heat a thick bottomed pan or kadai on a low flame. then add 1 cup urad dal (black gram) in it. if you want you can rinse the urad dal first. spread the lentils on a plate/tray/cloth. dry the lentils naturally or in sunlight. once the lentils have dried, then add them in the kadai. if you want you can add directly too. 2. keep the flame on low or sim and begin to roast the urad dal. 4. keep on roasting and stirring for even browning and cooking. 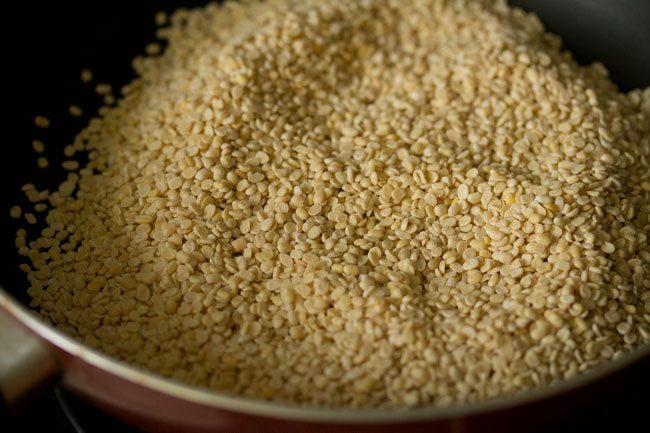 roasting urad dal well is very important or else there can be stomach aches. 5. this is the dal after 12 minutes of roasting. 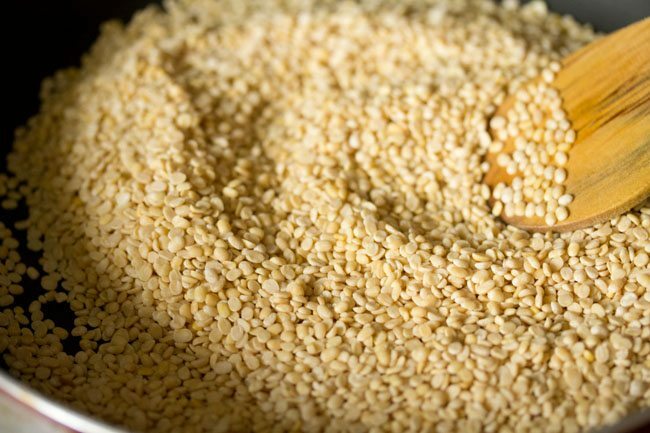 the dal needs to be golden and become aromatic. 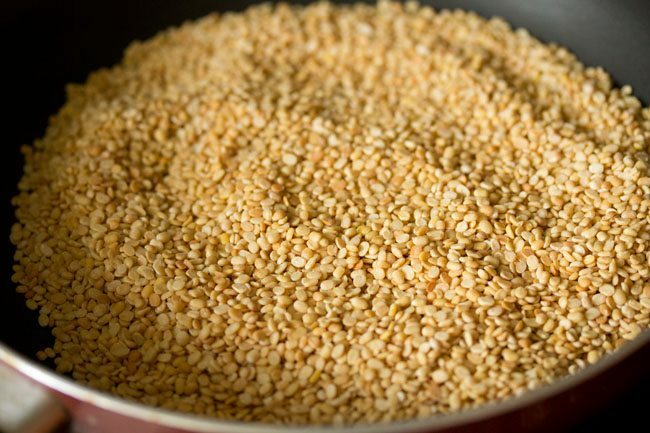 your kitchen will smell with the aroma of roasted urad dal. also as i have mentioned before, use a thick bottomed pan or kadai. 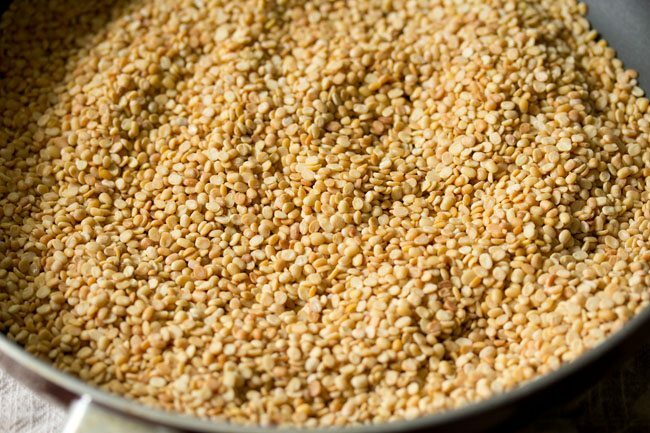 if the pan or kadai is not heavy or has a heavy base, then the urad dal will get browned too fast with uneven cooking and roasting. 6. here is how the urad dal looks after roasting for one more minute. keep on stirring without a break once the dal begins to get light golden. 7. now let the dal cool in the pan itself or you can remove the dal in a plate and let it cool. 8. once the lentils have become warm or cooled down, add them in a grinder jar. also add cardamom seeds removed from 3 to 4 green cardamom pods. 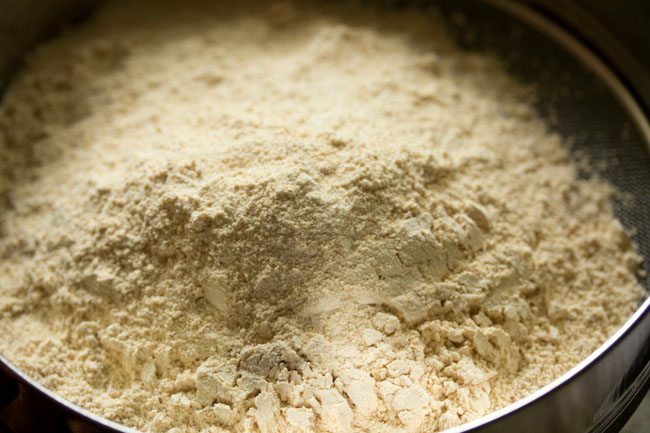 10. now take the urad dal flour in a fine seive. 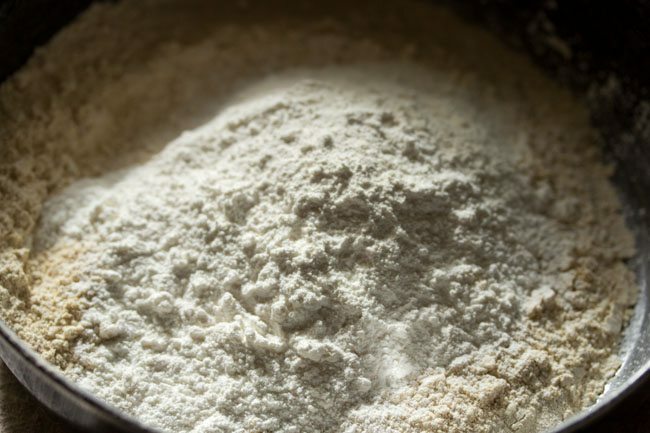 11. begin to sift the flour on a plate or tray or a large bowl or pan. 12. here are some of the urad dal grits remaining. 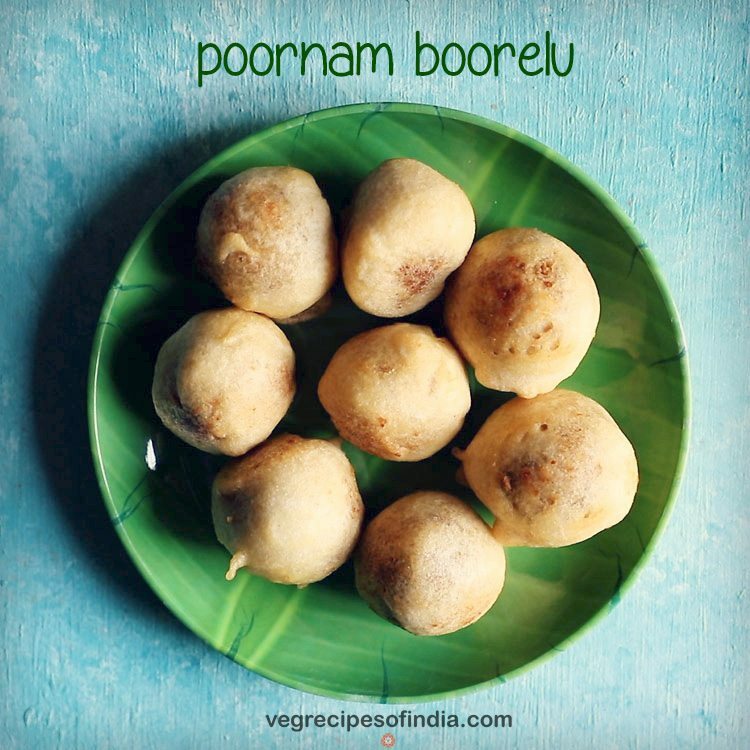 you can add these to rice or dal or even veggies while cooking. 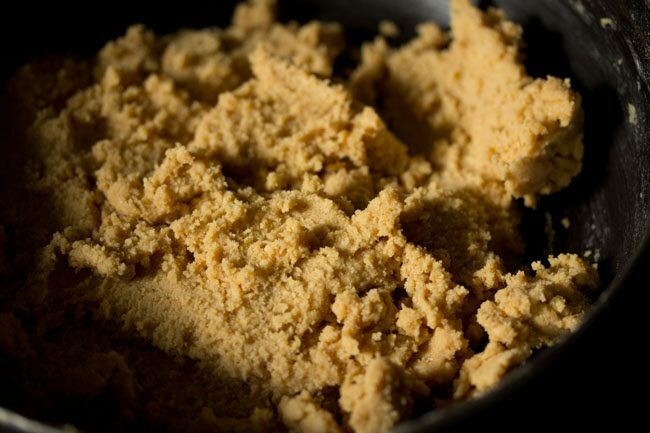 do use a fine sieve, otherwise you will get a gritty and grainy texture in the ladoos. 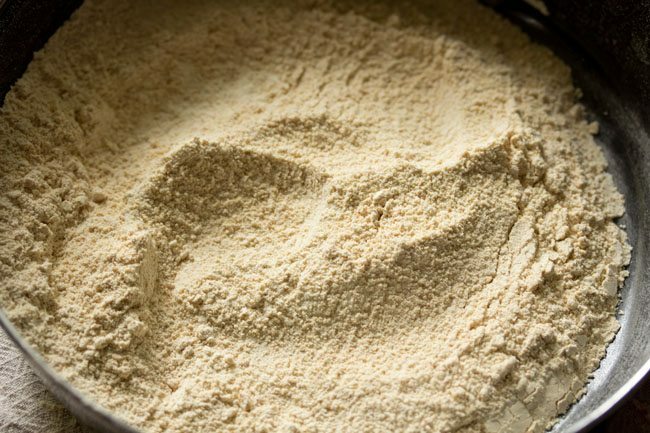 13. keep the sifted urad dal flour aside. 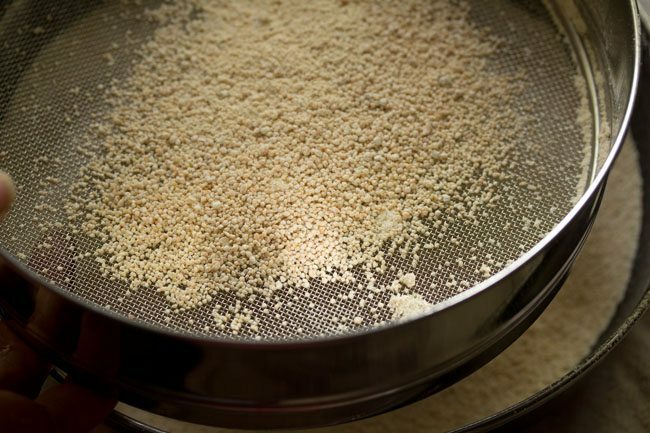 14. in the same grinder, add ⅓ cup sugar. 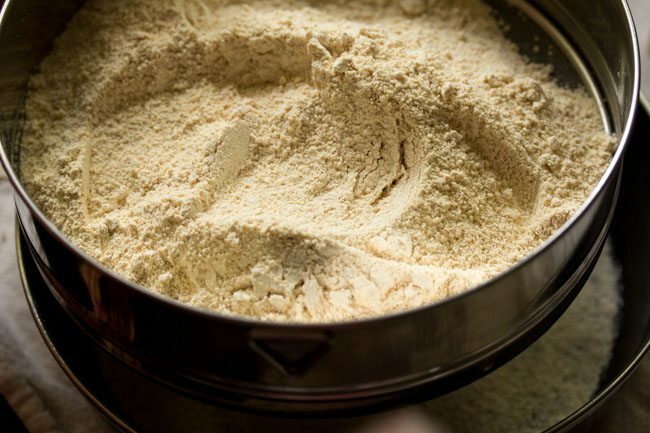 15. grind sugar to a fine powder and add the powdered sugar to the urad dal flour. 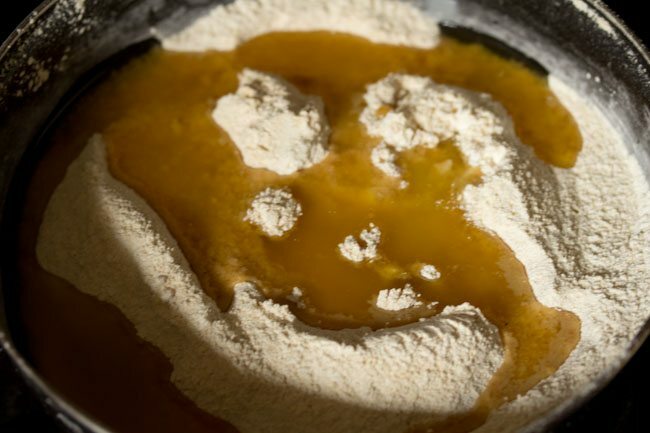 if you want you can even sift the sugar and then add. 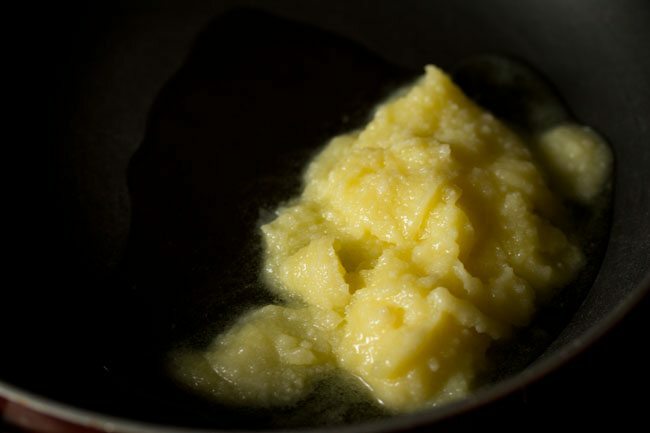 17. now melt ⅓ cup ghee in a pan. you just need to melt the ghee and not heat it. if adding dry fruits, you can add some sliced or chopped dry fruits at this step and saute them in ghee till they become light golden. 18. add the melted ghee to urad dal + sugar mixture. 20. you see how the ladoo mixture looks like, molten and a bit fluid. now let this mixture cool down at room temperature and let the ghee solidify. 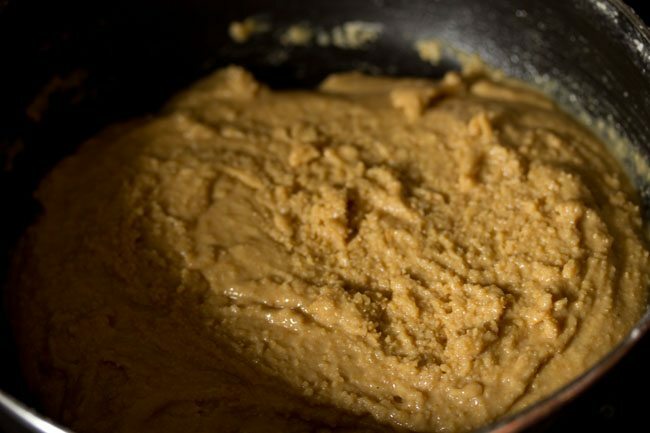 21. here is the same ladoo mixture after cooling down. 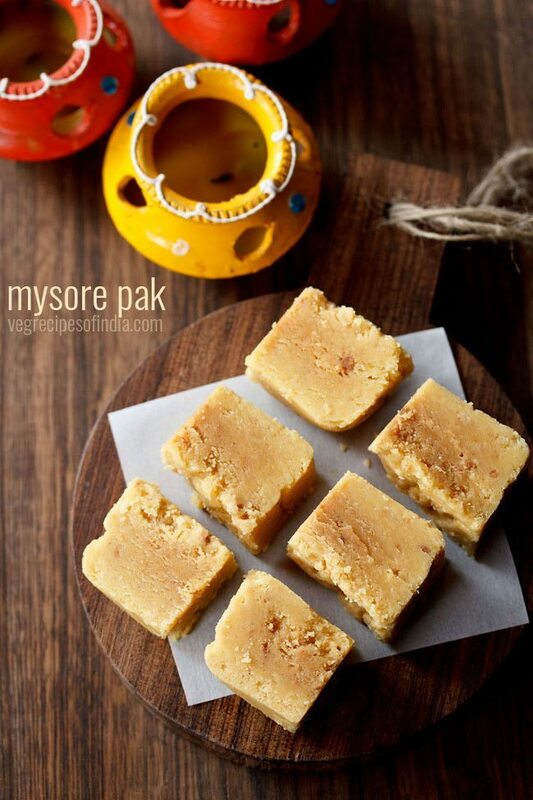 it has become dense and now you can easily shape the mixture into ladoos. 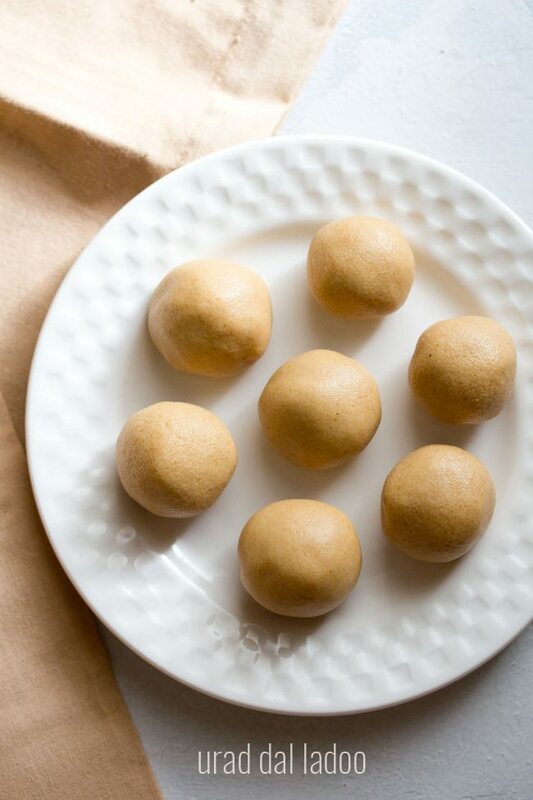 22. make small to medium sized ladoos. from the warmth of your hands, the ladoos will soften while you shape them. 23. prepare ladoos like this with all of the mixture. 24. you can even offer these urad dal ladoo to the deities as naivedyam or serve to your family. store the remaining urad dal laddu in an air tight box or jar and refrigerate. divya, they do not have a sooji like texture. they have to be ground fine like a powder. 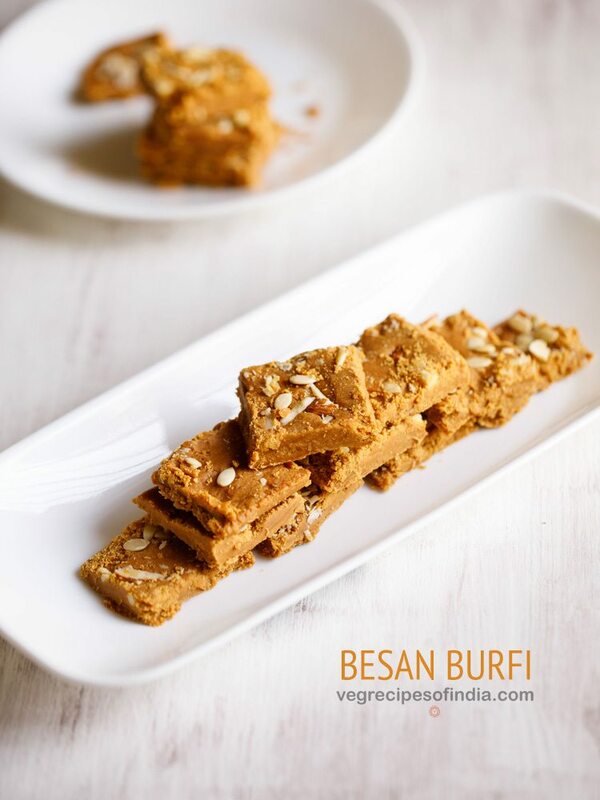 in fact they have a texture similar to besan ladoo. 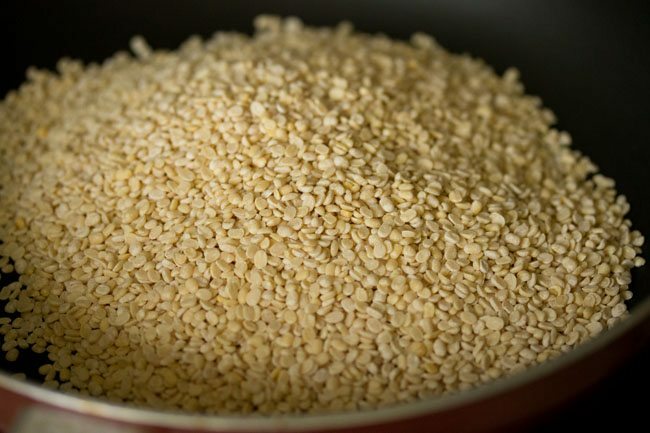 since they have been ground coarsely, thats why the sooji like texture. hii dasana, ur recipe is too good, but i used readymade roasted urad dal flour . I roast it again like basan ladoo recipe but still it gives raw test while eating.. what to do? okay. break the ladoos. add some water or milk in it cook on a low flame. 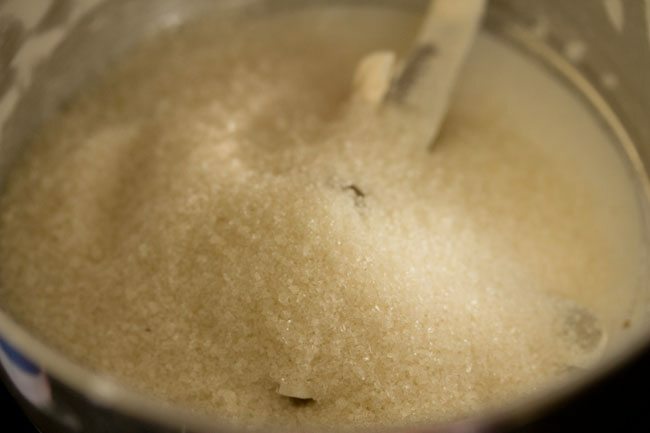 water needs to be added, so that the sugar does not get crystallized and becomes hard. just enough water to make a thick paste. keep on stirring while cooking the mixture for some minutes. you will only need to cook it for a few minutes. usually the pre roasted packaged flour or sooji are not roasted well. yes, you can do this way too. but make sure the flour is roasted well. It was nice to learn nice,sweet,delicious,mouth watering,healthy, and at the same time easy to make. With material already available at home. I don’t have words in praise still ‘am trying to make up.